Happy end of term! I know most schools are finishing now, so congrats for another great year - and enjoy the holidays; no one needs recharging more than a teacher. In honour of the end of the summer term I'm choosing something that you might like to explore out of the classroom as well as when you're back next September. For my Tech Trumps® Friday Focus this week I've gone for the beautiful, intuitive, and very collaborative Milanote. Milanote is an online board where you can write notes, upload images and add links, and connect them together in any way you please using lines. Basically it's a visualisation tool, which allows you to express something using visual layout with text and images. There are quite a few tools out there like it, but personally I find Milanote one of the best because it's just so lovely to look at, and easy to use. It's rare to have something quite so easy to get started with. Whilst it looks very simple, it also has some depth. Notes can be formatted quite well, with all the usual bold, italic, bulleting etc., images can be captioned, pretty everything can be coloured, and lines can be augmented with arrow heads or curved if you wish. Once things have been connected with lines they stay connected, so you can move things about without losing those connections. Want more? Well, you can add columns to your board - vertical collections of linked items - or even nest new boards within other boards, creating something which appears simple but with lots of depth. And did I mention it's collaborative? Simply add someone else by email and they'll be able to edit it as well. Finally you can export your board in multiple ways, so it won't stay locked into the website if you don't want it to. How can you use it in education? Milanote is particularly strong on Collaborating and Planning, so let's look at those two aspects. Learning by yourself is all well and good, but every good educator knows that the best way to learn is by experiencing the thinking of others. It's only by exposure to other perspectives that we begin to challenge our own thinking and develop new ideas. Sometimes this might be through reading a book, perhaps through watching a film even, but the trouble with those passive experiences is that they lack response to thinking, they lack that challenge. At the heart of social constructivism you find that zone of proximal development, that special area where students are beyond what they can learn by themselves, but not yet stretched so far that they lose comprehension - you find challenge, and nothing helps that develop better than Collaborating with others on a task. Milanote can support that process by allowing groups to co-create a visualisation on a topic. 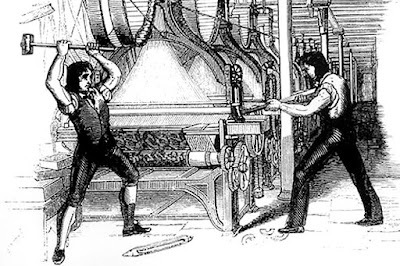 In a straightforward writing project tasks can be broken up and assigned to individuals; these tasks are then typically completed independently and hence the whole benefit of working collaboratively is lost. It's co-operative rather than collaborative. With Milanote on the other hand students have to work together, they have to discuss how to shape a board because it works as a whole entity rather than as a group of disparate pieces of work - and through that group discussion they will develop their thinking. Planning is, of course, a big part of teaching. Even for experienced teachers who have moved beyond detailed lesson plans for every class, there's still a need to be looking at the broader picture, and making sure what whatever you have lined up for the days, weeks and months ahead makes sense as a whole. The type of constructive alignment that is recommended does not necessarily come easily. 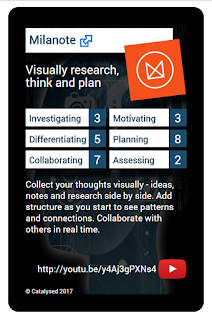 Visualisation tools like Milanote might not be everyone's favourite way of exploring planning, but there is something in the challenge (there's that word again!) of visualisation that can help you see connections, and identify possible weaknesses, that otherwise might remain hidden. Plus the ability to move something into a visual form means that it can then be shared with others and help them understand the complexity of your thinking. When used as a team Milanote can provide a great scaffold for collective thinking, for example when working on new schemes of work for a specific department. On one level you can use notes and arrows to show progression and links between content, and on another level you can use nested boards to show complexity and depth of work. 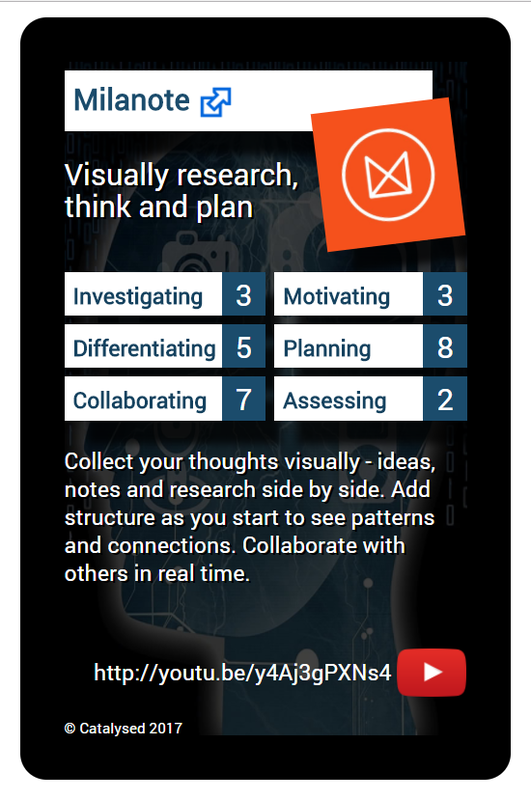 So that's about it for Milanote - a wonderfully designed web app, elegant and simple to use, ideal for supporting student collaboration or for helping you to plan out your thinking visually. Do you have any ideas for using Milanote that you'd like to share? Please feel free to add them in the comments! 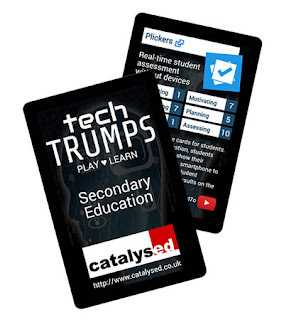 Would you like your own set of Tech Trumps®? P.S. This will be my last Tech Trumps® Friday Focus for a few weeks, as we're now entering the school holidays. I'll be back in September with some more apps, and ideas how to make the best use of them in education, so stay tuned - and if there's anything in particular you'd like covered please let me know in the comments.